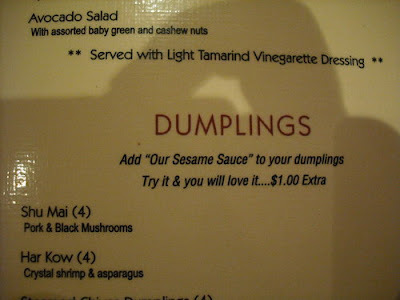 I don't know what kind of sauce you might put on these dumplings, but I'm guessing it's not real special. Thanks, Paul. It's also apparently not theirs. The people running the restaurant next door should probably be checking their sesame sauce supply daily. I'm thinking they spiked it with something. This picture is awesome due to the shadow of the photographers finger.